I love these boxes for my shower steamers. I wrap them in plastic sleeves and then insert them into these boxes. Nice, perfect fit so that the steamer doesn't get jostled around. Excellent presentation to the customer, also! Lost customer because these boxes are almost coragated boxes. 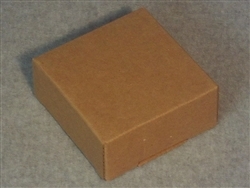 They are very thick and don't fit together very well my customer would not accept his order because of this, so I lost a $300.00 order because the boxes were not regular kraft soap boxes that could be used in the store to put on a shelf, they are to close to a mailing box!